A member of my re-enactment group has been in correspondence with someone from the Musee Archeologique du Lac Paradru in France and has been trying to glean information on a fragment of plate described as potentially being part of a "broigne" and being from somewhere around the 1040 to 1080 timeframe. My, admittedly poor, understanding of the term broigne is that it is a cognate of byrnie and was being used in Carolingian documents to refer to armour which older historians assumed was some kind of scale but which was probably all mail. 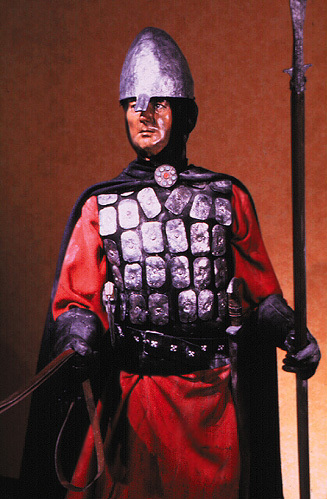 At the very least, I have not seen anyone with a realistic recreation of Frankish armour that leads me to believe the 19th century interpretation is legit. The interpretation I am investigating is that it belonged to something like a coat of plates. The piece depicted has only a brief description in the Museum's catalogue and I am not sure where the dating information came from but it is very interesting if true. "Several iron plates, often very slender, roughly circular or polygonal (4.4 to 7.4 cm in size) with a strong central rivet holding a small counterplate, may have come from a broigne (Fig. 149-9 to 21). The spacing between the two plates corresponds in any case to the section of a thick leather (0.5 to 0.6 cm)"
Source: Colletiere de Charavines p. 216 from Musee Archeologique du Lac Paradru. Translated by Google Translate. I have no more bibliographic information than this as I'm working from a incomplete scan of the catalogue. Attached are small images of one of the plates, in all probability excavated from the mud of Lake Paradru. Has anyone got any information that would lend credibility to the claim that this is from an 11th century coat of plates? I know it is a century earlier than the conventional beginning of the use of CoP. I think the most likely answer is that it is a misdating, a misinterpretation of an artefact (it doesn't have four rivets and could be something else), a mistranslation or some other misunderstanding but I'm curious as to whether others have encountered this particular artefact. If it is truly what is being speculated on then it is a very exciting find. Sounds like they're using a couple bits of metal to prove the existence of studded leather armor! My guess, they're fittings from a box or trunk of some sort, 18th or 19th century. Trying to tie them to a Carolingian word for "mailshirt" is a stretch even for Victorians. But I'd love to hear what folks with more experience say! Agree with Matt. The fragments aren't from armour at all. The French have to deal with Viollet le Duc's terrible book on armour and the ramifications in later works such as those by Contamine. It is amazing what contortions they put themselves through to try and prove the existence of some crazy armour constructions. A good English parallel can be seen with Meyrick's dodgy armour book and later works such as Ashdown. Though Arador lost my footnotes during a reformat. Thanks for your perspectives. I thought if it were genuine there would be more than a brief mention of it in an obscure catalogue. Oh, the vast majority of antiquities get little or no publication, particularly little unremarkable bits like this. And mind you, we can't *prove* their interpretation is wrong! It just seems highly unlikely, given all the other possibilities. 1) a museum catalogue reference from "Colletière a Charavines", one of the three armed settlements on the Paladru lakeside. I'm sure other members of this forum can help with further bibliography of these sites, but from what I can gleam, these finds are from the 1970ies, not 19th century? While keeping in mind Dan's and Mat's cautious remarks, it would be interesting to know more of context and interpretations. Here's some tiny wee info on the excavations. And a short discussion and reconstruction of the scale armour/"thin equipment remnants" (and other martial accessories like fragments from sword, crossbows, spurs, spears,war axe and a possible mail ring). Renée and Michel Colardelle 1980, "L'habitat immergé de Colletière à Charavines (Isère): premier bilan de fouilles", in Archéologie médievale 10, pp 167-203. - is described as causing a sensation when describing the horsemen-peasants who 950-1050 lived "in a large house" there. - anyone read the article or further work by Michel Colardelle and Eric Verdel? Michel Colardelle et Éric Verdel (dir. ), Les habitats du lac de Paladru (Isère) dans leur environnement : la formation d'un terroir au xie siècle, Paris, Maison des Sciences de l'Homme, 1993, 416 p.
Michel Colardelle et Éric Verdel 1999 ?? Colardelle, Michel, Jean-Pierre Moyne, and Eric Verdel. “L'armement des chevaliers-paysans de Charavines au XIe siècle.” In: Wider das «finstere Mittelalter»: Festschrift für Werner Meyer zum 65. Geburtstag. Schweizer Beiträge zur Kulturgeschichte und Archäologie des Mittelalters, 29. Basel: Schweizerischer Burgenverein, 2002, pp. 107–16. Oxford Handbook of Wetland Archaeology is allways interesting. The most common threat on any battlefield was from arrows and spears. The construction in that photo would be useless against those weapons. Any time small plates are used to make armour, they are assembled so that they overlap.